Derrick Evans · Business · U.S.
1. There is lots of competition. 3. Write an offer if you have the interest in a property, you will need to act, this market won’t wait for a buyer to think about it over nite! As of Tuesday, the 30-year fixed rate mortgage averaged 4.39 percent, according to Mortgage News Daily. Last summers rates were near record lows of 3.44 percent. Home buyers will likely expect to pay about 3 percent more each month on their loans. For example, a home priced at $250,000 with 20 percent down will see about $29 dollars more added to their monthly payment. These small changes we’re seeing shouldn’t price people out of homeownership! Another short-term rate hike is expected by the end of the summer! Rents and housing costs are increasing faster than other components because of the stubborn housing shortages in much of the U.S. More home construction is needed now. With the passing drought! homeowners have had concerns about keeping curb appeal up around their property rather than letting their grass and all the vegetation die. Artificial Turf has become the wave of the future, especially after dealing with water restrictions. Artificial Turf is a great way to maintain the curb appeal that most homeowners have been so proud of! Turf has come a long way, it’s now more natural looking, softer, kid-friendly and even pet-friendly with proper drainage! No maintenance or irrigation! This is the perfect way to go to keep your yard green and manicured year around! We aren’t exempt from another drought! The City of Oceanside! Wow, this city is really on the move with new Home Construction Restaurants, Micro Breweries, Movie Theatres, Farmers Market, Museums, The Arrowood Golf Course and easy access to the Coaster. 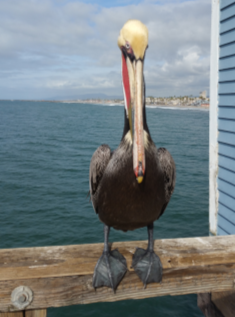 The Oceanside Pier is a great place to spend the day or evening at Ruby’s Diner located at the end of the Pier with fantastic views, fishing, even an occasional Brown Pelican dropping in to share in the local delights of the fisherman! As you can see these beautiful birds have no fear of people! I was able to get up close and personal for this picture as he poses! The access to the beach for a stroll or sunset concert on the sand is just a matter of walking down the stairs. As you may or may not know the home where Top Gun was filmed with Tom Cruz still stands. Oceanside is one of the last affordable housing and beach front communities with views and the marina just steps away. I really enjoy Oceanside and all it has to offer! Go spend the day, you love it! Please don’t hesitate to give me a call with any questions. I’m always available to help you achieve your Real Estate Goals!